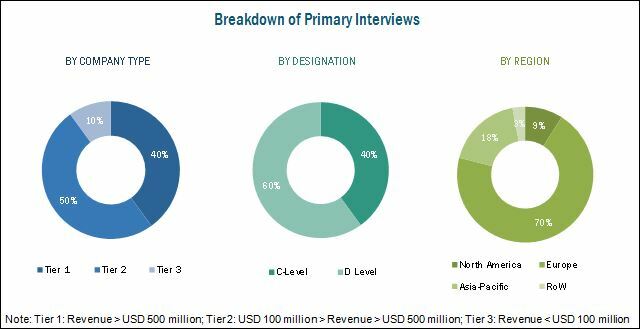 [201 Pages Report] The microbiological testing of water market, in terms of value, is projected to reach USD 1.59 Billion by 2022, at a CAGR of 7.0% from 2017 to 2022. Microbiological testing of water include testing of various industrial and drinking water for numerous pathogens such as Legionella, Coliform, Salmonella, Vibrio, Clostridium, and others including bacteria, protozoa, and viruses. Growing food safety concern is increasing the need for microbial water quality analysis. This has attributed to the growth of this market. The market players are responding to these new opportunities by expanding their global presence and product lines. This report includes estimations of market sizes for value (USD million). Both, top-down and bottom-up approaches have been used to estimate and validate the size of this market and to estimate the size of various other dependent submarkets in the overall market. Key players in the market have been identified through secondary research through various sources such as the Food and Agriculture Organization (FAO), the U.S. Food and Drug Administration (FDA), the World Health Organization (WHO), the International Food Information Council Foundation (IFICF), the Environmental Protection Agency (EPA), and Centers for Disease Control and Prevention (CDC), and their market share in respective regions have been determined through primary and secondary research. All percentage shares, splits, and breakdowns have been determined using secondary sources and were verified through primary sources. The microbiological testing of water ecosystem comprises instruments, test kits, and reagent manufacturers such as 3M Company (U.S.), Thermo Fisher Scientific, Inc. (U.S.), Danaher Corporation (U.S.), Döhler GmbH (Germany), and Agilent Technologies, Inc. (U.S.) as major players. The other players such as Shimadzu Corporation (Japan), Sigma-Aldrich Corporation (U.S.), Perkinelmer, Inc. (U.S.), Bio-Rad Laboratories, Inc. (U.S.), Idexx Laboratories Inc. (U.S.), and MilliporeSigma (U.S.) also have a significant presence in this market. This research report categorizes the microbiological testing of water market based on pathogen type, water type, type, industry, and region. Segmental analysis, which provides a further breakdown of the instruments and test kits & reagents in the type segment. The global market for microbiological testing of water has grown exponentially in the last few years. The market size is projected to reach USD 1.59 Billion by 2022, growing at a CAGR of around 7.0% from 2017 to 2022. Emerging countries such as India, China, Japan, Brazil, and Argentina are the primary targets of the industry. Factors such as increase in microbial contamination in water reservoirs due to increased urban waste, stringent regulatory environment, the emergence of new technologies, and upgradation of equipment are the major driving factors for this market. Moreover, advanced technologies and rapid test methods helped to drive the microbiological testing of water industry. The microbiological testing of water market, based on pathogen type, is segmented into Legionella, Coliform, Salmonella, Clostridium, Vibrio, and others which include other bacteria, protozoa, and viruses. Number of tests for Salmonella dominated the market with the largest share in 2016 due to increasing Salmonella outbreaks in the European and North American regions. This is followed by Coliform tests, which acts as an indicator bacteria for other bacterial analysis and plays a critical role in microbial water testing. The global market, based on type, is segmented into instruments and test kits & reagents. The instruments segment accounted for largest share of the microbiological testing of water market in 2016. The test kits & reagents segment is projected to grow at the highest CAGR from 2017 to 2022. Rapid testing methods ensure the analysis of a larger sample size, thereby reducing the time required for sample testing which will lead to the growth of test kits over the next five years. The global market, based on industry, is segmented into pharmaceutical, clinical, food, energy, chemicals & material, and environmental. The pharmaceutical segment dominated the market with the largest share in 2016. Whereas, the food testing segment is projected to grow at the highest CAGR due increase in food safety awareness among consumers and growth in labeling mandates in various regions. Based on water type, the market is segmented into drinking & bottled water and industrial water. The industrial water segment dominated the market with the largest market share in 2016, and it is projected to grow at the highest CAGR due to increase in industrial applications and growth in regulatory compliance. This market was dominated by the North American region in 2016. The Asia-Pacific region is projected to be the fastest-growing market during the forecast period due to emerging economy, globalization of trade, and growth in industrialization in the region. The microbial water testing solution manufacturers require high capital investments. Due to this reason, high capital investment is restraining the market growth. Expansions, new product & technology launches, acquisitions, and agreements, collaboration, and partnerships are the key strategies adopted by market players to ensure their growth in the market. The market is dominated by players such as Bio-Rad Laboratories, Inc. (U.S.), Agilent Technologies, Inc.(U.S.), Thermo Fisher Scientific, Inc.(U.S.), Perkinelmer, Inc.(U.S.), Shimadzu Corporation(Japan), and Sigma-Aldrich Corporation (U.S.). Other major players in the market include AcceptaLtd (U.K.), Lamotte Company (U.S.), Danaher Corporation(U.S.), MilliporeSigma (U.S.), 3M Company (U.S.), and Idexx Laboratories Inc. (U.S.). Figure 21 Capital Investment in Water and Wastewater Infrastructure in the U.S.